CINCINNATI -- Life without Lauren has not grown easier for the Hill family since she died of an inoperable brain tumor in 2015, but her legacy lives on at Saturday's third annual Lauren Hill Tipoff Classic at Xavier. Lauren, who wore a No. 22 jersey, would have been a senior on this year's Mount St. Joseph basketball team. "It's really difficult. It's a difficult year for everybody," said Lisa Hill, Lauren's mother. "She would have turned 22. She did turn 22 Oct. 1. It is in itself a magic number, right? It's kind of a bittersweet year." In 2014, Lauren Hill captivated the world with her fundraising efforts on behalf of The Cure Starts Now Foundation and the quest to end pediatric cancer. The NCAA allowed Mount St. Joseph to play Hiram College at an early date so Hill could compete in her first college game. The forward scored the first and last baskets of the Lions' win at sold-out Cintas Center and raised more than $2.3 million before her death the following April. Saturday's festivities are extensions of her milestone college hoops debut. Kids in eighth grade and younger are invited to participate in a Bounce for the Cure dribbling event before making their Layup4Lauren attempts at 4:30 p.m. outside Cintas Center. 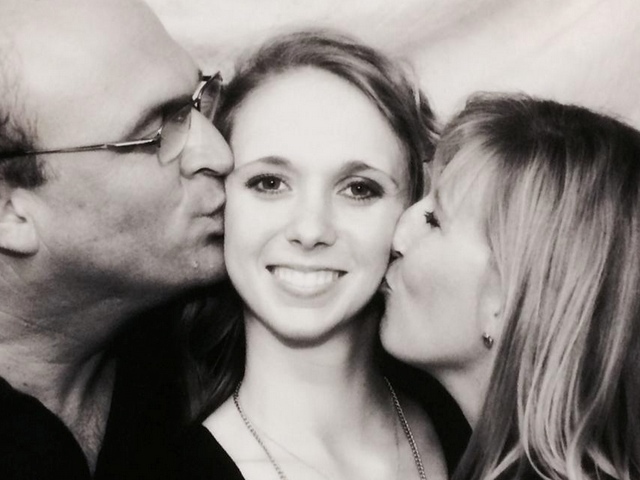 Lauren Hill with father Brent and mother Lisa. The action moves inside soon after for two women's basketball games: Xavier versus New Hampshire at 5 p.m., followed by the Mount versus Hiram at 7:15 p.m. Proceeds from ticket sales ($10 for adults and $5 for youths) benefit The Cure Starts Now. Lisa Hill, an event coordinator for the charity, said building upon initially robust donations has been challenging. Although she hopes to raise $100,000 this year to increase Lauren's overall fundraising efforts to $2.4 million, growth has been slow. "We reached, I think, the $2.2 million mark right after she passed. The sad part for me is for as much momentum as she had going into the game or right after the game, things have slowly trickled off. I know she has made an impact, her story on people and they remember it, but the momentum as far as raising research funds under Lauren's name has dwindled," Mrs. Hill said. "We haven't found a cure yet. We're still in search of it. We still need research dollars. It's just fighting for all these kids, and I think that part of the message needs to still be out there, that pediatric cancer is still very much underfunded. Although we know a whole heck of a lot more now than when Lauren was diagnosed, still the treatments are not any better." Mount coach Dan Benjamin said he has awoken without an alarm clock all week in anticipation of Lauren's event. Only one player was on the Lions' team when Lauren played -- senior Rachel Fairfield -- but others on the roster attended the game with their high school teams and know Lauren's mission. In addition to touching so many others' lives, Benjamin said Lauren's endeavors put women's basketball "back on the map." "Lauren, in my opinion, is the female Jimmy V (former North Carolina State coach Jim Valvano). She's done great things for pediatric brain cancer, but not just cancer. She's done great things for all people throughout the world," Benjamin said. This year, for the first time, all four Tipoff Classic teams will meet for a pre-game dinner at Lawrenceburg (Indiana) High School, Lauren's alma mater. Xavier coach Brian Neal said the entire experience has been humbling, and he's greatly anticipating a group gathering. "Every year that goes by, there are players on our team and other young people that don't know the story so well. So it's going to be good that we get to hear the people talking, the speeches, the ‘Play for 22' documentary. Every time you go back this time of year and you think about it and you look at some of the stories, it really does still bring back a lot of inspiration," Neal said. Mrs. Hill and Benjamin spoke in a Thursday press conference at Xavier about Lauren's impact in unexpected places, from lives she affected to inspiration she created. She had a funny, silly side that most people didn't get to see. A jokester with a playful sense of humor, Mrs. Hill said. She's still trying to wrap her mind around the way her daughter resonated with others. "I call it a multi-faceted story because it was basketball, it was young adulthood, it was on the cusp of adulting and just spiritual. And she had a lot of life lessons that everybody took away from it," Mrs. Hill said. "So to listen to other people's stories on how they related to her and what piece they took of Lauren with them is fascinating to me because everybody was touched in a different way, and inspired. She kind of was her own force to be reckoned with." To donate to pediatric brain cancer research on behalf of Lauren Hill, visit layup4lauren.org. For ticket information for Saturday's games, visit GoXavier.com .